The “success” of a species is generally taken to be indicated by its population though it is of course possible to have quantity without much quality of life. In general however, an increasing population of any species does indicate the sufficiency of food, the ability of the species to withstand competition from other species and the ability to breed successfully in the prevailing conditions. And so it is for humans. Based on population, modern humans have never been as successful as they currently are. And in spite of all the doom-sayers and the alarmists, the fact remains that more humans are being fed and housed and are achieving some large part of their aspirations than ever before. They are living longer than ever before and their life expectancy is still increasing – currently by about 2 -3 months every year. 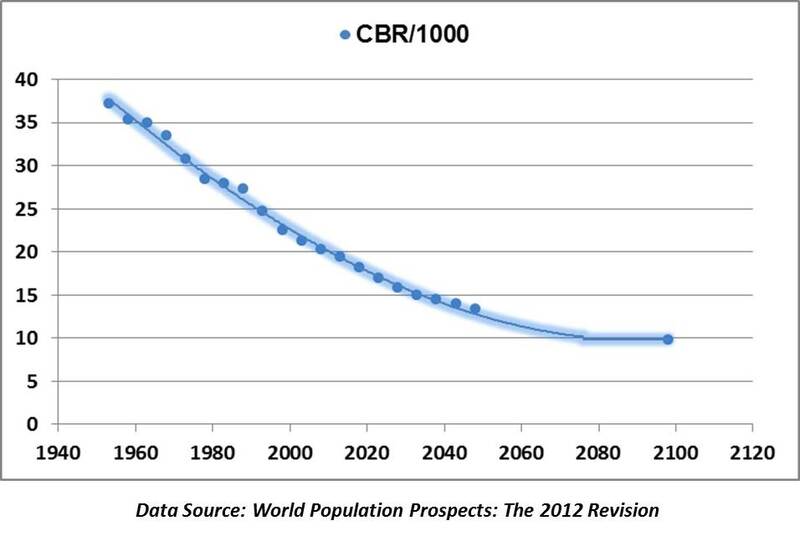 However just looking at the crude birth rate (number of births per 1000 of population) might lead one to a conclusion that there was a catastrophic decline in the human species. 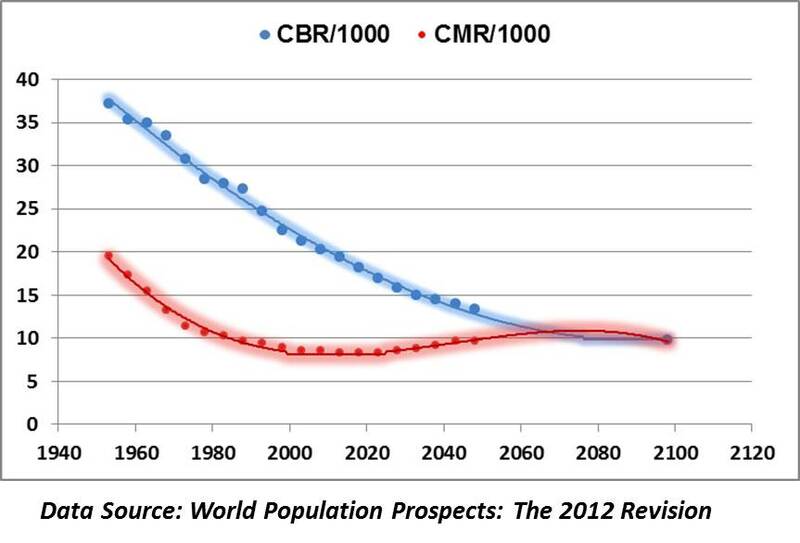 Birth rates have declined from about 37/1000 in 1950 to less than 15/1000 now and are projected to be around 10/1000 by 2100. For any other species that would be a catastrophic decline. But of course that conclusion would be quite wrong when applied to humans. The mortality rate of humans has also declined drastically as medical and public health advances have been made. And human ingenuity has maintained food and material supplies such that life expectancy has increased in spite of a booming population. 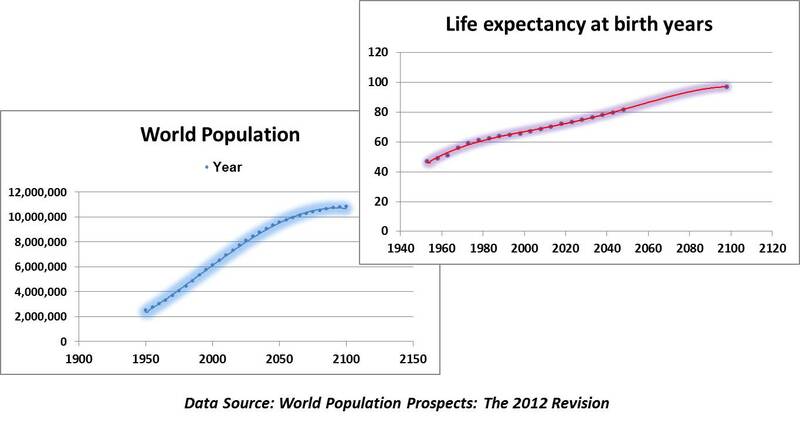 The fact that population and life expectancy have increased simultaneously is a clear indicator that the quality of life has not deteriorated. There may be problems of equitable distribution but there is no shortage of food or other resources – and no prospect of any catastrophic shortages occurring. All other indicators tell the same story. Infant mortality, poverty and malnourishment are all at all-time lows and declining even if these can be lower still. The real GDP per capita is increasing. Leisure time (time not spent on the requirements for survival) is increasing and for more people than ever before. The age of space exploration and the potential for access to new sources of raw materials and even real estate has already begun. There are many who rail against the consumer society and materialism but generally do so from a position of some comfort. There are others who moan the loss of spirituality and yearn for a return to a simpler life but they too are not quite ready to return to the trees. There is no shortage of doom-mongers and alarmists who merely keep pushing their doomsdays into the future where they cannot be disproved. It is a question of attitude. There are those who would prefer to be governed by fear (the precautionary principle) and there are others who would move forward in spite of their fears. But the reality is that the human species – with all its warts and threats and self-inflicted problems – is thriving. It is not a forecast or an objective but merely the inexorable arithmetic of demographics which leads to the inevitability of 10:10:10:100 around the year 2100. 10 billion population, 10 births per 1000 of population, 10 deaths per 1000 of population and a life expectancy at birth of 100 years. I prefer to see the glass half-full rather than the glass half-empty. Why do we penalise successful species and protect the failures? Almost as if we we wish to deny evolution by ensuring the survival of those which don’t deserve to survive. If Giant Pandas were not as disinterested as they seem to be in reproducing themselves and as specialised in eating only a few species of bamboo, but instead were immensely successful in increasing their own numbers, then we would no doubt be organising Panda culls. But since they are an almost perfect example of a species bent on its own extinction we go to all possible lengths to keep them going! Yet another story where a successful species which adapts to and make use of humans and human behaviour is then considered a “threat”. Unsuccessful species of course would become “endangered” and would then be protected! BBC: The problem of invasive ants may be far worse than previously thought. A Spanish team of scientists has found that larger than expected numbers of the insects are being unwittingly shipped around the world. The researchers warn that many of these species are establishing colonies in their new habitats that could pose a threat to the environment, infrastructure and human health. The research is published in the journal Royal Society Biology Letters. 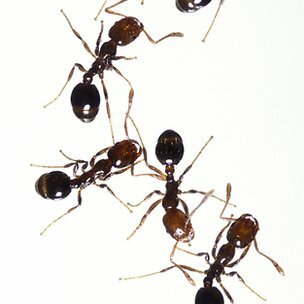 The research team looked at the numbers of exotic ants in the Netherlands, the United States and New Zealand. They found far more of these accidental stowaways than had previously been reported. Extrapolating from this data, they estimate that 768 exotic ant species could have been introduced around the world through trade routes. Of these, they believe that more than 600 species could have established new colonies. While not all animals that move to a new region pose a threat, some can wreak havoc – and invasive ants are some of the worst alien offenders. Sometimes having different ecosystems and environments within a particular region is also included as being a form of ecological biodiversity. Yet it has always been inexplicable to me as to why human intervention for the protection of a species which has been out-competed by other species is not considered unnatural and artificial. Extinction of species happens naturally as a consequence of natural selection and evolution as some species succeed and others fail. If species did not fail and become extinct there would be diminishing space for evolution of other species. More species are thought to have become extinct than are in existence today. I find that there is a fundamental conflict between allowing evolution to happen naturally with successful species (and that includes humans) eliminating unsuccessful species and the conservationist view of interfering with this normal development in favour of artificially maintaining failed species. Conservationism at heart is a conservative (with a small “c”) and backward looking philosophy trying to prevent development and evolution because of fear. I suppose that is why I find “conservationsim” unattractive – because it is based on fear subordinating actions and that – by definition – is cowardice. King Canute trying to hold back the tide! As I have posted earlier: The problem is not only that we have not identified all the eukaryote species in existence (and about 1.3 million have been classified and named) but we have no idea whether the number in existence is to be measured in millions or in hundreds of millions. About 15,000 new species are identified and catalogued each year. If Bacteria and Archaea are added to eukaryotes, the total number of species could be in the billions. And with so many species around why should humans interfere to protect some but not others. In fact some species are considered interlopers in some regions and then conservation is all about exterminating these. We do not know how many frog species exist and new species are being “discovered” continuously. Species thought to have become extinct are rediscovered. Of course a “discovery” of a species has nothing to say about how long that species has been in existence. And the importance of any particular species to the future of humans and the environment humans survive and thrive in is an unknown unknown. 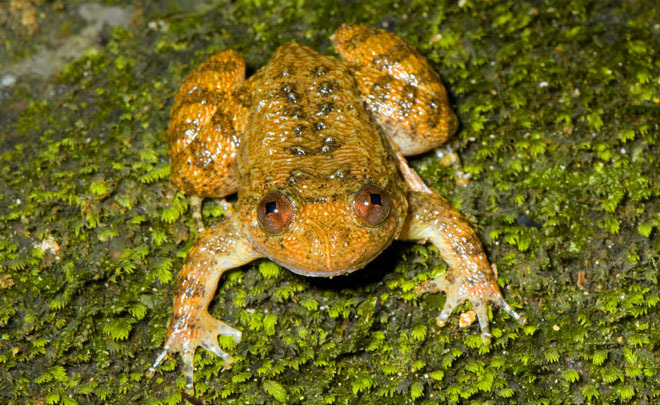 Wired – which is a very politically correct on-line journal – reports that 12 New and 3 Lost Night-Frog Species Discovered in India. Researchers in India have found a dozen new frog species belonging to the night frog group, named for their nocturnal habits, and rediscovered three species, one of which had not been seen in nearly a century. The findings appeared in the journal Zootaxa on Sept. 15. …… half of the newly discovered species reproduce without any physical contact between the sexes, with the female depositing her eggs on a leaf and the males later fertilizing them. All the frogs were spotted in a region known as the Western Ghats, a mountain range than runs along the western coast of India that has been identified as one of the ten hottest biodiversity hotspots in the world. Because of the small area they occupy, at least six of the new species are sensitive to habitat loss and will require immediate steps toward conservation. I find the conclusion that “the new species are sensitive to habitat loss and will require immediate steps toward conservation” illogical and inexplicable. Just the number of articles about frogs in Wired in recent times further deepens the mystery. It only demonstrates all we don’t know that we don’t know. Even if out of fear of what is to come, humans were to try and intervene and protect every discovered species, the intervention would still fail and would not return us to the time of the dinosaurs. Conservationism – as an ism – has no clear purpose that I can see.